Minnesota state parks provide and preserve necessary habitats for Minnesota’s birds. Whether it’s the bogs of Lake Bemidji State Park or the prairies of Blue Mounds State Park, there are a variety of bird species you can see. There are many resources for birdwatching in Minnesota state parks, so grab your binoculars and hit the trails! We're thrilled to introduce Birds of Minnesota State Parks, which was 11 years in the making and includes more than 200 pages of maps, color photos and insider tips on finding and identifying over 300 birds that can be seen in Minnesota state parks. 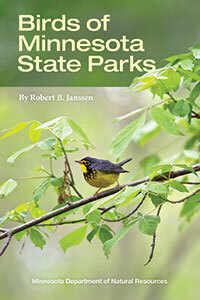 The book was a labor of love by noted ornithologist and author Bob Janssen, Minnesota State Parks and Trails, and the Minnesota Nongame Wildlife Program.